SpearfishingToday was founded in 2008 and is now operating in Cancun, Cozumel, Holbox, Isla Mujeres, Playa del Carmen, and Tulum, Mexico. At Spearfishing Today, our work is our passion. Our company is run by professional PADI and FII-certified spearos who strongly believe in spearfishing as the most selective way of fishing. They do what they love and they love what the do. It’s this passion and commitment to excellent customer service that allows us to receive our guests as strangers and see them leave as friends. Over the course of the last almost ten years, we’ve received hundreds of spearfishing enthusiasts. From complete beginners to professional spearos, at Spearfishing Today we always ensure that our clients have spectacular adventures — From Sea to Table. We hope that we will have the opportunity to do the same for you. TripAdvisor Hall of Fame – 7 straight Certificates of Excellence (2011-2018). We believe spearfishing is one of the last “mano a mano” extreme sport challenges in the world. All of us are very passionate about what we do. We live to spear and spear to live. You deserve an authentic spearfishing adventure. Our FII, PADI-certified spearfishing guides will make sure you get exactly that. Leo is the founder of Spearfishing Today and a world-renown spearo. His motto is “More with Less.” Since the beginning of 2017, he only hunts with a polespear and likes to eat in a hammock. 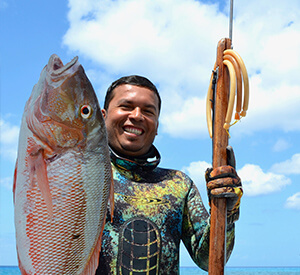 Anibal is a kind and passionate spearo, father, and husband who has been sharing his talents as a professional guide and captain with Spearfishing Today clients for the last five years. Five years ago, Diego left behind the comfort of his mariachi lifestyle and private ranch in Guadalajara to follow his passion to become a professional spearo in the Mexican Caribbean. Yeehaa. Andrew is a passionate spearo with an incredible amount of talent and patience. A FII-certified freediver from England, he is in charge of all our spearfishing operations in Cancun and Isla Mujeres. Pamela is our resident freediving instructor and all-around awesome spearfishing guide. Born in Mexico City, she now lives on Cozumel Island although her home is the Caribbean Sea. Chief Inspector Mister Bigotes is our resident-in-chief quality control officer in charge of receiving, inspecting, and approving all incoming goods at our dock in Puerto de Abrigo. We only work with the very best spearfishing gear providers. We’re proud of our alliance and thankful for being able to work together with the best in the sport.